In this issue we comprehensively look back at the European research programme CORE. How public and private parties joined forces to lay the fundations for safe and secure trade lanes. 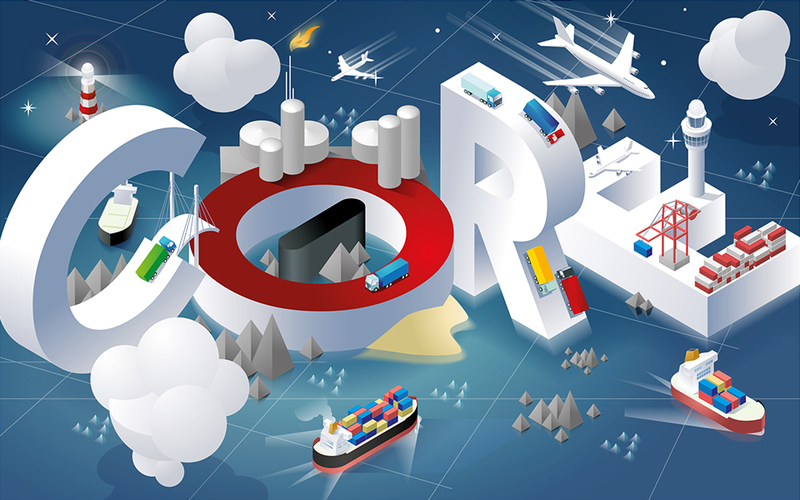 In the past few years, Customs NL inSight sometimes briefly reflected on CORE: an ambitious European research programme focused on faster, more reliable and more efficient trade and logistics, combined with an even more adequate supervision of goods chains. Now that the comprehensive project has officially come to an end, we will delve more deeply into its continuing significance for both business and industry and government. An exploration of our world of tomorrow, one which shall revolve around data even further. The four capitals which together create ‘CORE’ are an abbreviation of Consistently Optimised REsilient secure global supply chains. Under the banner of the programme, private and public parties at home and abroad have worked together for four years on dozens of innovative initiatives in order to optimise the integrity of goods chains and the related data. In the Netherlands, for example, the companies Royal FloraHolland, Seacon Logistics and IBM/Maersk provided a significant contribution, each with its own pilot project. All of these projects focussed on the development of a so-called data pipeline, a solid system for the safe collection, (re-)use and exchange of all kinds of relevant digital information by the various links within logistic chains. This concept – which has different forms – firstly benefits global trade, and especially serves the commercial interests of market players who make use thereof. Indeed, the growing amount of available data on consignments and movements of goods offers them an increasing insight into their business processes, and helps them to improve these. This not only involves storage, transportation and distribution, but also production, marketing and sales, for instance. In turn, government parties also have the potential to profit from the data pipeline phenomenon. The data circulating within such a shielded channel could after all be shared with competent supervisory authorities in a relatively simple, discrete and real-time manner. This helps these agencies gain a broader and clearer insight into the consignments to which this information pertains, such as the nature, origin and destination of the goods. Allowing them to fine-tune their risk analysis, to make smarter inspection selections and to thus elevate their enforcement to a higher level. It was in this spirit that Dutch Customs, among others, participated in CORE on behalf of the government of the Nederlands. The programme served as grist to the mills of the service as the research objectives almost seamlessly geared to its enforcement vision Pushing Boundaries. The core of this philosophy is a stratified enforcement concept, with a suitable inspection pressure tailored to every market party – from the reliable company to the unknown entrepreneur. Regarded as the highest feasible are so-called safe and secure trade lanes or trusted trade lanes: fully ethical logistical chains thanks to reliable and secure digital data. From the perspective of customs these are ideal: they require only a small amount of monitoring effort, so that more time and manpower remain for customers who do in fact merit explicit attention. This approach would enable the service to continue to properly carry out its seemingly complex dual social role – of supervisor of goods and trade facilitator. Also with respect to the anticipated sustained growth of freight volumes in the national mainports. In this issue of Customs NL inSightwe look back at CORE, and thus cast our eye on the future of logistics and customs processes. We do this together with representatives of said participating Dutch companies and – of course – our own service. What progress has been booked during the course of the programme, and which possible steps forward are still to be made? Roel Huiden (RoyalFlora Holland), Gé Coenen (Seacon Logistics), Norbert Kouwenhoven (IBM/Maersk) and Mitchell Out (Dutch Customs) will explain this in the following series of four.